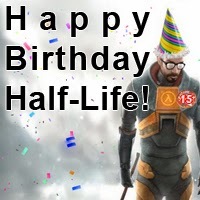 HAPPY 15TH BIRTHDAY HALF-LIFE! Black Mesa has some big news! Last year, Black Mesa was one of the first Steam games to be Greenlit by you, our amazing fans. We've had quite a year since then, with a lot happening internally that we haven't been able to talk about... until now. Black Mesa has been given the opportunity to be sold as a retail product on Steam! This is an incredible honor - one we never expected - but also one we found hard to accept. Soon you'll see Black Mesa available on Steam for a relatively low price. But we aren't dropping all support for the free version. In fact shortly after the Steam release there will be a completely new free version of the game. We also plan to open source our maps and some game assets to the modding community! Purchasing the Steam version of Black Mesa is more about supporting the team and our efforts than anything else. However, the Steam version will include features that the free version simply can not have. We will be paying careful attention to feedback, and you'll have a very real say in how the final game turns out. We've been overwhelmed by fan anticipation for Xen, and we're excited so many people are eager to conclude the game. To be totally honest however, Xen is still a ways off. Over the past year, we have spent a HUGE amount of time porting the game to a new engine and fixing hundreds of bugs. The work to port to the new engine was not because of the decision to go retail, this was work that had to be done to get Black Mesa onto Steam and support our future plans. The positive response to our announcement has been overwhelming! Thanks to you all for sticking with Black Mesa and supporting our collective efforts.